Daily Turismo: 10k: 1972 Cow-rare-a; ? If you happen to view the Daily Turismo regularly and own a dairy or ice cream vending service...boy are you in for a treat. 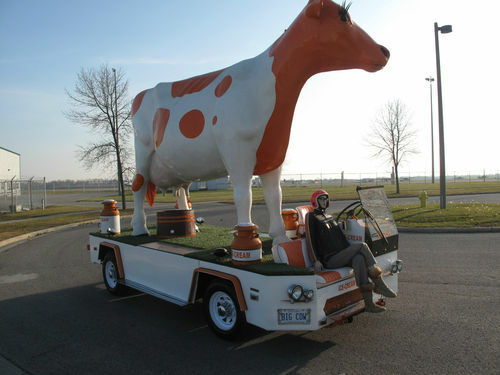 What started out as a 1972 Ford Pickup has now been converted into a three passenger giant cow carrying cruiser...the Cow-rare-a, for sale in Ontario, Canada via ebay with a starting bid of $10,000 (Canadian or US..it doesn't really matter these days). 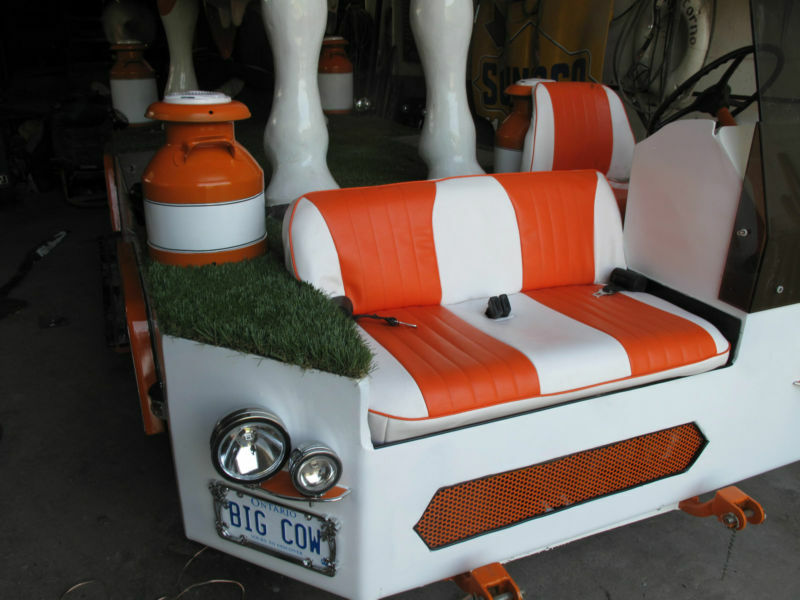 This is what we call a rare ride - a bonafide mooo'er and a shaker. It is titled as a 1972 Ford Pickup, but the configuration looks more Econoline Van to us and is powered by an undisclosed inline-6 mated to an automootic transmission. The interior is...well...there is no interior, in fact, its all exterior. It is a good thing that this is a pre-1973 vehicle, because there is no way that a human ankle will pass the US DOT 5mph impact test and allow this car to be homogolated. We have strong doubts about achieving the European Type Approval certification either...but it should get 5 stars for the much maligned 2009 European pedestrian impact standards that raised hood-lines and required comfy seats on the front of many economy cars and giant cow themed parade floats. The seller doesn't say if the mannequin in the photos comes with the Cow-rare-a and we would be udderly disappointed if it didn't. 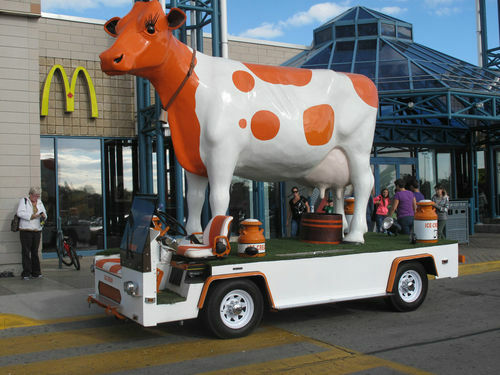 He does specify that it took 2300 hours of labor to build the Bovinovan and that "there are buttons located that children can push to actually make the cow milk and others that will make it moo on command." Awesome. the flat-plate freezers and back up generator make this perfect for a parking lot party or bar-b-que side show. i'm in the moood. Wow, this one really mooooooo-ves me!